The third edition of Santa Olalla Food Fair in Toledo has revolved around the need to bury the idea that frozen foods are not as “healthy” as refrigerated ones. And of course, attending was mandatory for Eurofrits since it is an idea it fully subscribes. Last week, our brand made an appearance along with Disalcon95, a leading supplier in the Catering, Hotel Industry and Restoration sector. 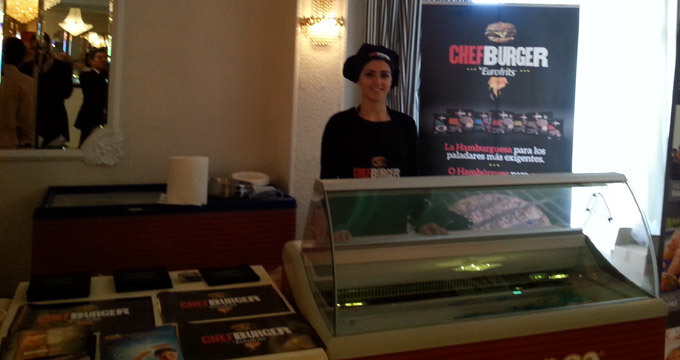 We exhibited some of our different ranges: potato specialties, chicken pops and, the main attraction of the show, our range of Premium Hamburgers, ChefBurger. Our chef prepared our products live and offered trials among the attendants, clearly delighted in particular with our Premium Hamburgers, made exclusively from top quality guaranteed beef burger of 100% national origin.